Boston University welcomed back alumni last weekend to remember the past, celebrate the present and plan for the future. 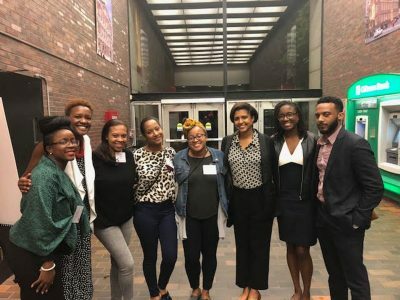 The Celebration of Black Alumni during Alumni Weekend invited diverse alumni to reconnect with old friends and learn about new developments on campus since their undergraduate years. Recipients of the 2018 Distinguished Alumni Award were among the crowd of graduates, including Bill Brooks (Questrom School of Business ’86), Binoy Singh (College of Engineering ’89), Marylou Sudders (College of Arts and Sciences ’76 and School of Social Work ’78) and the recipient of the 2018 Young Alumni Award Erika Ebbel Angle (School of Medicine ’12). Karen Holmes Ward (College of Communication ‘77), chair of the Black Alumni Leadership Council, spoke highly of the recipients and said they represented the wide range of students and alumni. Brooks, a former wide receiver for BU’s football team, played for the Indianapolis Colts after leaving the team at the university. He said he contributed to non-profit programs Big Brothers Big Sisters of America, Boys and Girls Clubs of America and the YMCA. He said networking was a large part of his successes. Singh works as associate chief of cardiovascular medicine at Northwell Health – Lenox Hill Hospital and sits on the College of Engineering Dean’s Leadership Advisory Board. He founded the Imagineering Lab and said that his love for his work helped motivate him to do this. “Trust the process, love to learn, live to learn and be passionate about what you do,” Singh said. Sudders oversaw a $21 billion state budget and worked for Massachusetts’ Executive Office of Health and Human Services on Medicaid to help 1.9 million low-income or disabled Massachusetts residents. Angle is the founder of two companies, Science from Scientists and Ixcela, Inc., and said she committed herself to help young students foster their love for learning. During the panel, the alumni discussed societal engagement. Singh said that solving community problems requires the involvement of everybody, and Brooks emphasized the important role individual empowerment plays when encouraging community involvement. Attendees were given tours highlighting new developments, such as the brand new Rajen Kilachand Center for Integrated Life Sciences and Engineering and the expansion of the Howard Thurman Center for Common Ground. The Alumni Association also held “Tastes of BU,” a chance for alumni attendees to sample foods made by chefs and BU graduates. The final day of alumni weekend started with a brunch at the Dahod Family Alumni Center. Alumni and guest preacher Rev. Lawrence Carter led the attendees through an interdenominational worship. Stacey Rowland (CAS ‘86), a former BU track team member, attended the event and said she went to see her past peers. Sitting next to her was Scott Baker (QST ‘85), who was also a former BU athlete and friend of Bill Brooks. Baker said he appreciated returning to the diverse community on campus.